Android and iOS users can easily use this new Stickers feature of WhatsApp. WhatsApp has now made a tremendous update to make your chatting even more fun. With this update, you can now send stickers to your friends and family like Facebook. These stickers are open to both iOS and Android users. Once you download it, you can use it offline too. WhatsApp said on a blog post that these stickers will be available on the Android Beta version 2.18.329 and on the iPhone version 2.18.100. 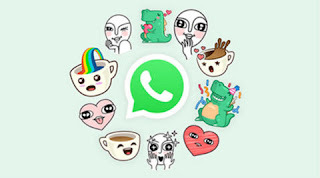 In this new Stickers feature of WhatsApp you will get a pack of 12 stickers. You can download your favorite pack from a lot of packages in your own way. Whatsapp has given a different stickers store to use this feature. Android and iOS users can easily use this new Stickers feature of WhatsApp. For this you have to go to the chat that you want to send the sticker. After clicking Chat-bar, click on the Emoji icon. After this you will see the options of emoji, gif and new sticker. You can easily send your favorite stickers by clicking on the stickers icon. If you do not see the stickers option in your WhatsApp, then you have to update your WhatsApp.